Hurghada once began life as a humble fishing village on the shores of the Red Sea but now she is one of the most visited tourist destinations in Egypt. Teeming with hundreds of hotels, swanky bars and stylish restaurants, it is the ideal destination for couples looking for a bit of adventure. Whether you're scubadiving amidst the coral reefs, quadbiking through the desert or taking tea with a Bedoin tribe, you will fall in love with this place. 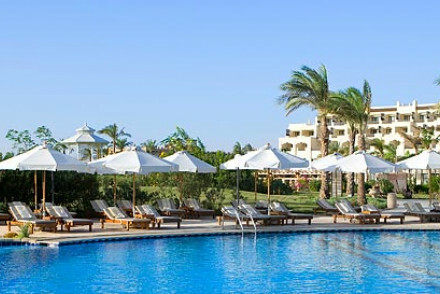 Our collection of the best places to stay in Hurghada will ensure that you do. The miles and miles of pleasant golden beaches is a defining reason for Hurghada's popularity. The waters are as clear as glass and scintillating beneath them are kingdoms of coral reefs and the wandering denizens of marine life. Scubadiving is, naturally, quite popular here and the locals are great with beginners, and it's a fine way of immersing yourself in the underwater world. But if scubadiving isn't your cup-of-tea, have no fear: you can hire a glass-bottomed boat to explore the seas and see, swimming beneath you, marine life. Hurghada, like many resort towns, teems with swanky bars and stylish restaurants. Cute cafes and food vendors line the beaches, and big commercial complexes like Senzo Mall allow visitors to go on day-long shopping sprees. There is also the Grand Aquarium, a great place to take the kids. The wide and wild stretches of desert plains surrounding the resort town are also worth exploring. Be sure to hire a motorbike or beach buggie and take a guided tour of the desert. You can even go camel riding through the desert, to far-flung ancient sites, or take a quadbike to a remote corner of the desert and take tea with Bedoin tribespeople. Don't forget to take a day trip to Cairo, where you can stand face-to-face with the Great Pyramid of Giza and immerse yourself in the world-renowed Egyptian Museum. Luxor, 4 hours drive away, boasts the Valley of Kings, a sight you mustn't miss! Take tea with a Bedoin tribe after quadbiking through the desert! Go camel-riding through the arid plains surrounding the town. Hire a glass-bottomed boat and see marine life swimming beneath you! Check out the Grand Aquarium. For a day trip, head to Cairo and marvel at the Great Pyramid of Giza! Go on a shopping spree at Senzo Mall. Hurghada is full of easy charm and wonder. Whether you're scubadiving through coral reefs, riding with Bedoin tribespeople or marvelling at the Great Pyramid of Giza, you will want to come back again and again. Check out our collection of the best places to stay in Hurghada to find out more! Steigenberger Al Dau Beach Hotel: a family-friendly resort with its own golf course, Red Sea spa, private yachts and scubadiving school. Many restaurants and bars leading down to the sea; the suites are elegant and have private balconies. Great for large families and watersports enthusiasts. 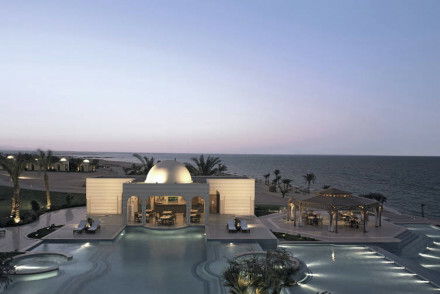 The Oberoi Sahl Hasheesh: a 5* luxury resort boasting its own private beach and coral reef to dive in. Romantic, the building itself resembles an ancient temple and the suites are cream-white with large balconies. The restaurants serve an impressive variety of cuisine and the infinity pools are dreamlike. Fly straight to Hurghada International Airpoirt - most major European airlines have direct flights there. There is sunshine all year round, but to best enjoy the warm water and escape the summer crowds, go in the autumn, when the temperature ranges between 17 and 35 degrees.